I've known for a while that I'd eventually switch from bottling to kegging, so I kept my eyes out for a good deal on kegs. About 18 months ago I was able to get four used ball lock kegs delivered for $200 from ebay, so I picked them up and put them in the garage. Fast forward to March of this year. My club decided to pour during Social Club at NHC and that meant I needed to keg some beer. I picked up a regulator, dusted off a still-full 10 pound CO2 tank from when I used to offroad. A few connectors and some tubing and I was able to fill and carbonate my keg. I used a picnic tap to dispense. It was a bare-bones setup, but I was able to keg my beer for NHC. Shortly before NHC I sold my house and moved into a new house with a bigger garage. 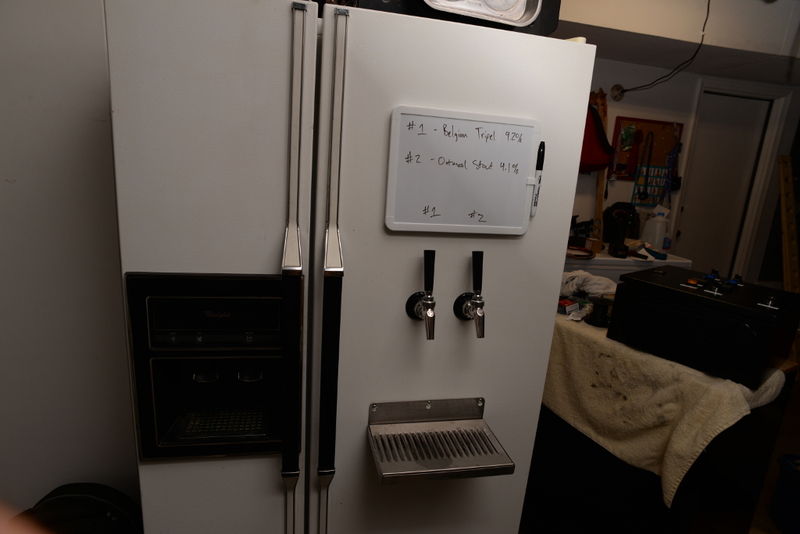 The previous owner didn't want to move a side-by-side refridgerator, so they sold it to me and I decided to convert it into a kegerator. I ordered a couple of Perlick faucets, some stainless steel shanks and hardware, and turned the fridge into a two-tap kegerator. My CO2 bottle is too big to fit in the fridge with two kegs. For now, I just connect the gas occasionally to re-pressurize the kegs. Long term, I'm going to invest in a secondary regulator to mount inside the fridge and run the gas line through the wall to the CO2 tank. With the exception of the beer tubing which was purchased from MoreBeer and the whiteboard which was purchased from Target, I purchased everything from RiteBrew.com as they had fair prices and everything I wanted in one place. Installation was relatively straightforward. I borrowed a 1" hole saw from a friend. After determining where I wanted my faucets, I used a center punch to put a little divit in the sheetmetal of the fridge to prevent the hole saw from walking all over the place. I then drilled the holes, installed the shanks, ran the beer lines carefully coiling up the additional line and securing it with velcro ties. I screwed the faucets on, then used my line cleaner to flush the lines with BLC for 15 minutes each. I recirculated clean rinse water for 10 minutes, then 15 minutes of Star San. Then I hooked up my kegs and started pouring. I mounted the drip tray with some sheet metal screws I had onhand. Because I already had a CO2 tank onhand, I was able to set everything up for about $250 sans secondary regulator. I'll probably pick up that secondary regulator soon (~$80) as it's a pain having to drag my tank over and refill the kegs when they start pouring more slowly or I notice the carbonation level a little low.